Thank you for visiting our Web site. We have many resources available here, including forms to register for our classes, information about our intern venture, details on our meeting spaces and more. If you have any questions not answered on the site, please call us at (320) 752-4700 or send an e-mail to erfarm@hotmail.com. New newsletter! The Spring 2011 issue is available now. Earthrise Farm was established in 1996 by Kay and Annette Fernholz, both School Sisters of Notre Dame, on the 240-acre family farm purchased by their parents in 1944. Rooted in the charism and ministries that define the School Sisters of Notre Dame, a 12-acre portion of the farm has developed into a community-supported garden, poultry coop, with a yurt being offered for some time away and opportunities for experiential Earth Literacy. 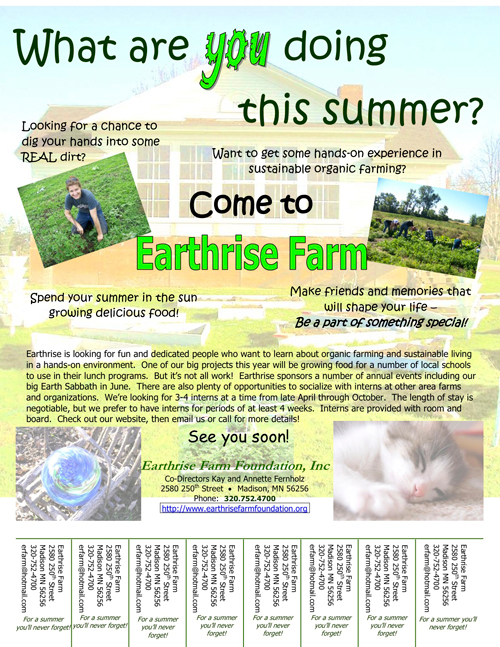 In December 2004, the Earthrise Farm Foundation, a nonprofit organization, was founded to fulfill our mission. With the help of our board of directors, volunteers and interns, Earthrise Farm continues to grow in its mission of renewing our Earth connections.